Brian Quint is the President of Aqua Quip Pool and Spa and has held that position since 1978, He also served as the Chairman of the Board of the National Spa and Pool Institute (now APSP) from October 2001 to October 2002. Brian is a graduate of Washington State University (1997) In Business and Economics. He graduated from Sammamish High School in Bellevue. 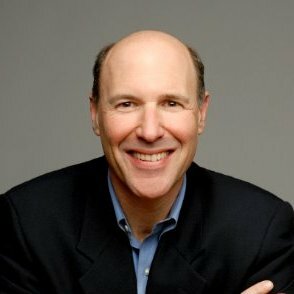 Brian is also: the Chairman-Elect for the Kline Galland Home, a senior care facility located in Seward Park where he has served since 1999; previously served as a Board member of the Bank of Washington; and spent 4 years on the Board of Directors for Archbright, an organization providing workplace performance experts, based in Seattle. 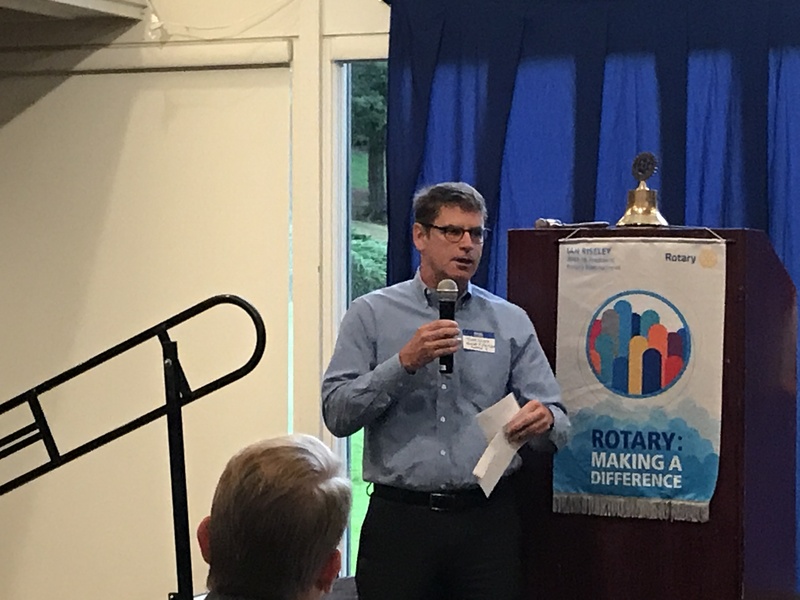 We were treated to an informative presentation by Brian Quint this morning, as he shared the birth and evolution of Aqua Quip. Most of us think of this company as a source for hot tubs, but learned it’s so much more. 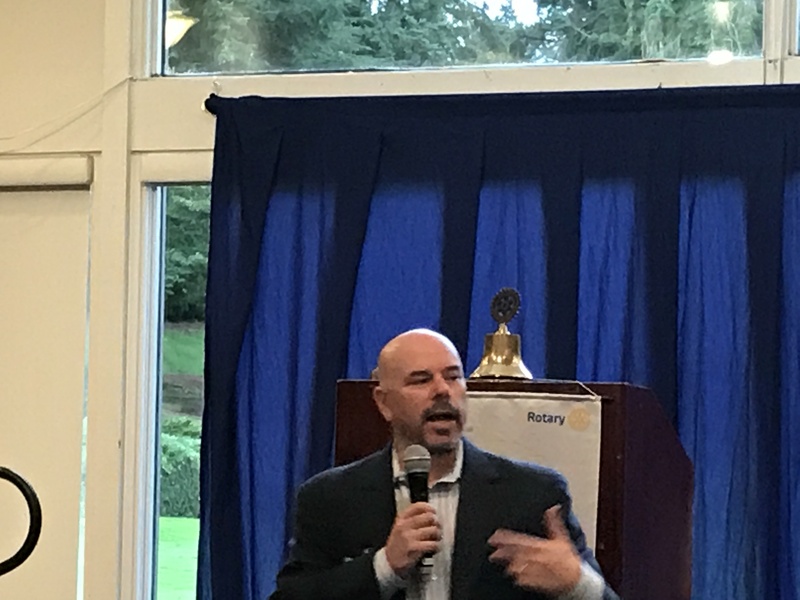 Brian was comfortable joining us at Glendale CC since he grew up a few blocks away and attended Sammamish H.S. More importantly…..he’s a WSU Coug, which may help explain his success in life. He learned about hard work and how to run a business from watching his parents operate their lumber business for several years. In 1979, they bought a pool and spa business, taking the family in a new direction. At that time the spa business was growing up the coast, from California to Washington. Aqua Quip’s business was growing and doing well, expanding to 11 locations in the early 2000’s. But then the recession of 2008 hit, dropping sales 15% that year, and an additional 10% the following year. Brian realized they needed to reinvent themselves in order to survive. Other competitors didn’t adjust and suffered the consequences. Brian used this time as an opportunity to educate their employees. In one case, he used 100 pennies to illustrate their cost of doing business and profitability. When the employees were asked to separate the pennies, with one side being their costs and the other side the profits, he was alarmed to see that the workers were under the impression the company was running at a profit rate of 30% – 40%, a surprising rate of return for a retailer. Brian went on to explain businesses like Aqua Quip normally generate single digit profit margins. More importantly, he knew he had more work to do with the store’s culture. To reinvent themselves, it was important for Aqua Quip to look beyond their core business of spas and swimming pools. Brian searched for other “like products” that home owners wanted. They soon identified BBQ’s and hearth products would be a good fit. Turned out to be a good move, as these quickly became 25% of the company’s revenue. Still looking for additional revenue sources, the company added electrical services, such as wiring hot tubs and plumbing gas fireplaces, as a logical direction. But in a time where retail outlets are fast being replaced by online companies like Amazon and other marketers on the Internet, how does Aqua Quip survive, and more importantly, flourish? 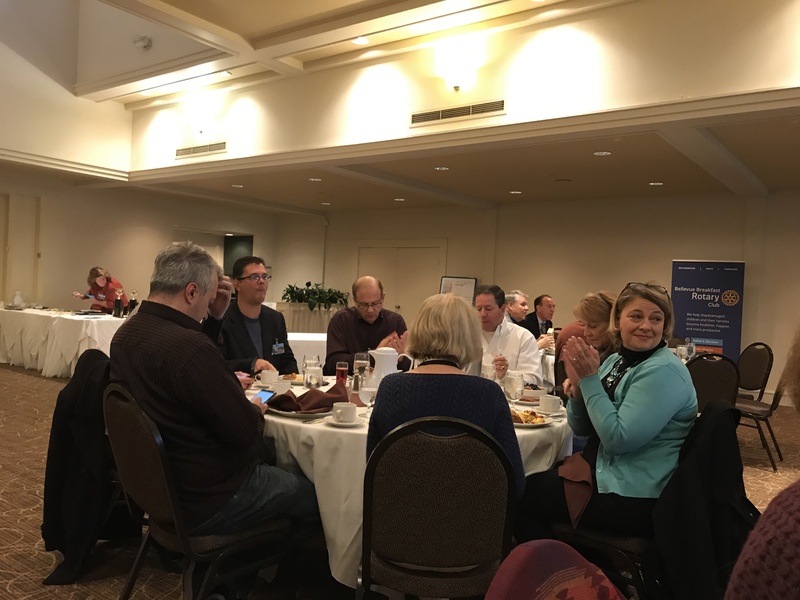 Brian says that’s their biggest challenge today….finding ways to differentiate themselves from what a customer, or prospective customer, can find on line. He even admits that a person can go online and order a spa today. But who’s going to deliver and install the spa? Who’s going to hook it up with the necessary wiring, requiring a certified electrician? Who will you call if you have issues or need servicing? These are some of the things that make Aqua Quip unique and separates them from online retailers. For Brian, it’s all about looking down the road 10 years from now and asking the question, “what will we be doing that will make us unique”? With 40 years of success at Aqua Quip, I’m sure he’ll come up with the answer. AtWork! at work. Alex Chehab and Debbie Moore spoke briefly about the great things that AtWork! is doing to help make a difference in our world. Alex talked about the importance of “hiring individuals of different abilities”. They went on to share statistics on organizations and companies that hire people with disabilities. Alex and Debbie thanked the BBRC for hiring greeters like Brady, Amy, and Coryn, just to name a few. Based on my experience, we should be the ones thanking them. My Friday mornings are better for it. Our favorite Happy Calorie girl, Carmela Ramaglia, gave us a brief insight into her past and how, through her life challenges, she came to discover Happy Calories Don’t Count. 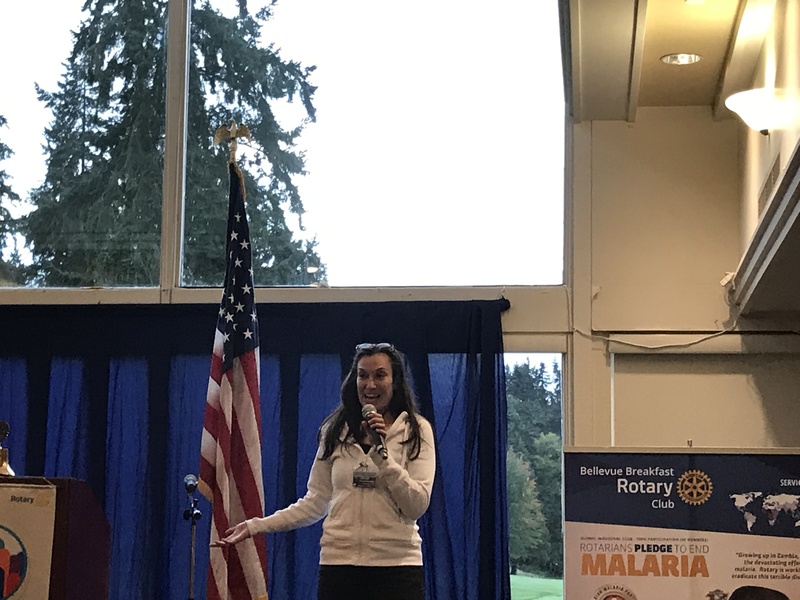 She went on to cheer about how the new and improved Rotary is a great vehicle for networking about your business and finding prospective clients. Go get ’em, Carmela! 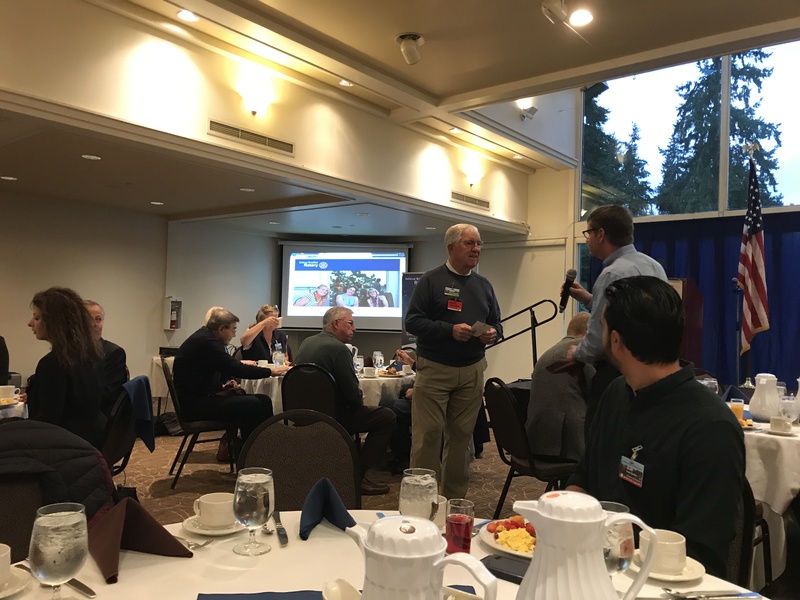 President Kaj wandered out into the crowd today to extend a warm welcome to members Chris Ballard and Cyril Faulkner, who have been M.I.A. 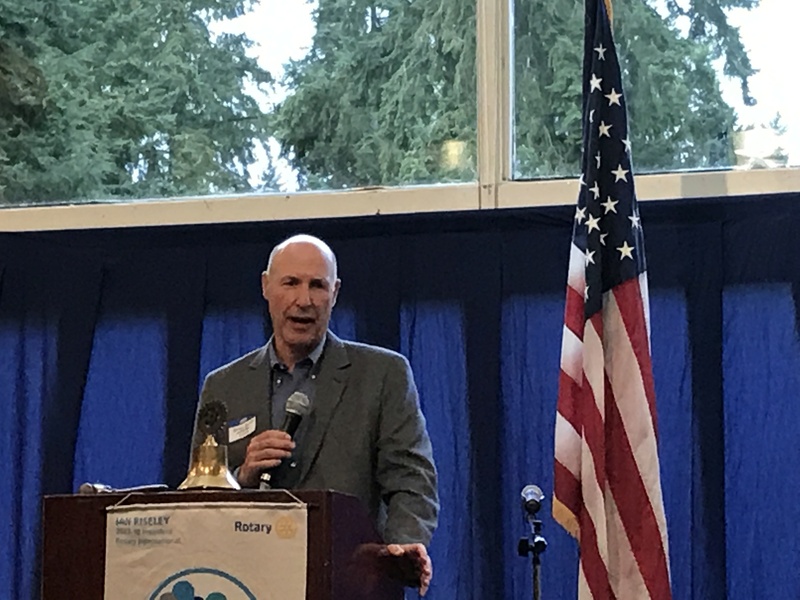 Just remember, folks, “you are all always welcome at the Bellevue Breakfast Rotary Club”! SPECIAL OLYMPICS WASHINGTON GETS $5,000! 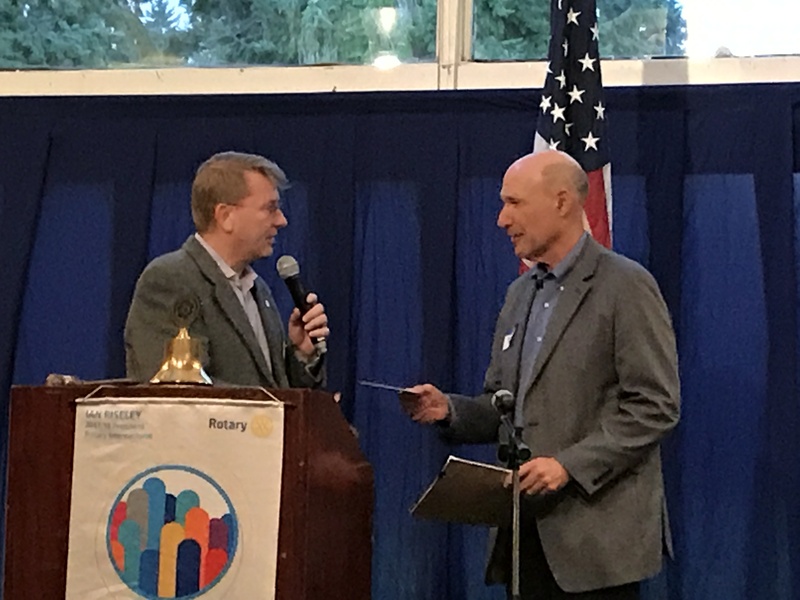 Dave Lenox, President and CEO of Special Olympics Washington, was on hand to receive a $5,000 check from the BBRC for his worthy organization. Dave was appreciative and talked about the people that are impacted by our donation. 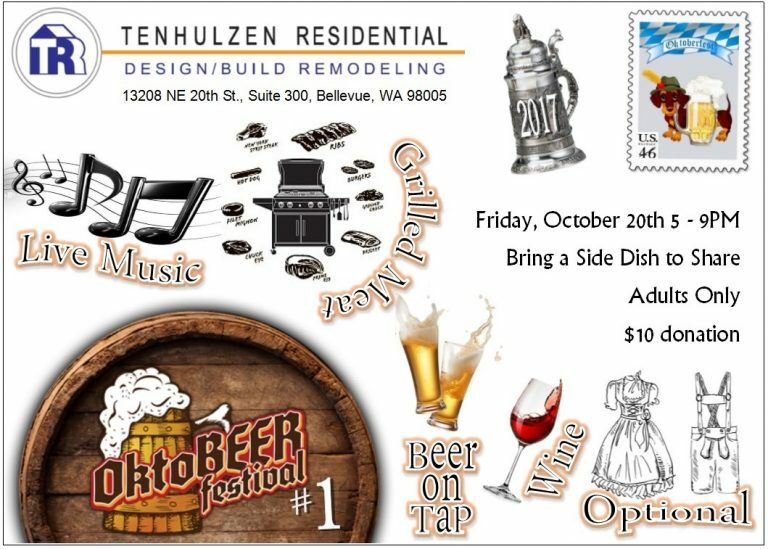 It’s always nice to see the fruits of our hard work from putting on the Bellevue 10k run/walk. BBRC Sargent-At-Arms, Curtis Cummings, apologized to the club for having been gone for awhile. He has a funny way of showing his remorse. While the SAA gave immediate immunity to members who had brought guests since July, he wasted little time fining Jenny Andrews and everyone else who hasn’t been helping grow our membership. (Hmmm…. as Membership Director, I think I’m OK with that idea.) The sheriff went on to warn us with some convoluted plan for further and larger fines if you don’t know certain things about future surprise guests….or something like that….that this scribe was unable to follow. The one thing I do know….bringing guests in the future gives you immunity. Guess that’s the safest bet. Good to have you back, sheriff……not! 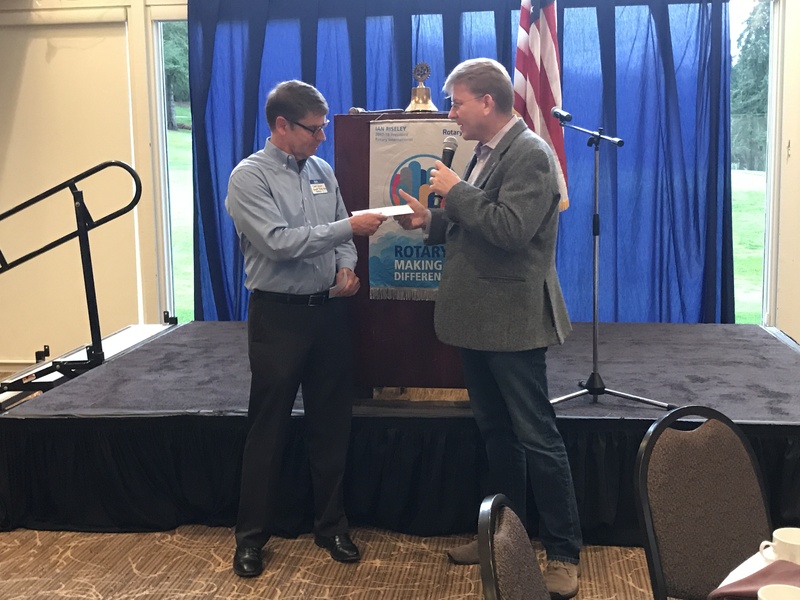 After President Kaj gave our guest speaker his certificate acknowledging that 1,000 #’s of fresh produce would be given to Rotary First Harvest in his name, sponsored by Chris Monger and Monger Properties, he left us all with this thought for the day….. 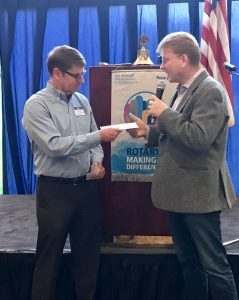 The donation to Special Olympics Washington is in support of their mission to support 17,000 athletes with intellectual disabilities, through their year-round sports training and athletic competition in a variety of Olympic type sports. This gives these individuals continuing opportunities to develop physical fitness, demonstrate courage, experience joy and participate in the sharing of gifts, skills and friendship with their families, other Special Olympic athletes and the community. Come join us for Friendship, Fellowship and Fun at our monthly 3rd Thursday Happy Hour! We’ll meet at 4:00 pm at Henry’s Tavern in the upper level of the new south part of Lincoln Center.